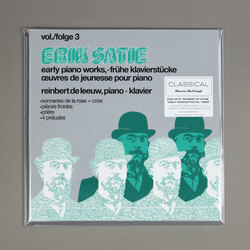 Erik Satie, Reinbert de Leeuw - Early Piano Works Volume 3. Vinyl LP. Bleep. Early Piano Works Volume 3 sees Dutch composer, pianist and conductor Reinbert de Leeuw bring to life some of the most astonishing Erik Satie compositions with this wonderful series of early piano works, made available on vinyl again in celebration of the 80th Birthday of Reinbert.